There’s an old saying that journalism is the first draft of history. I was thinking of that recently when I presented A.D.: New Orleans After the Deluge to students & teachers at Ben Davis High School in Indianapolis. Pretty much the entire 10th-grade there had read A.D. in their English classes, so I spent a full day at the school, bringing the story behind A.D. to the more than 1,000 kids from that grade (and a selection of 11th-graders who had read the book last year). It’s crazy to think that those students were around four years old back in 2005 when Hurricane Katrina hit the Gulf Coast and nearly destroyed New Orleans. So to them my book is not a journalistic perspective on the disaster, but rather (ancient) history. … there are many, many stories about Katrina and its aftermath. Those of the seven people in A.D. are quite particular and highly personal, but my hope is that they provide a window into a larger world, one that few of us understand and that we’ll be trying to make sense of for a long time. And I always paraphrase that sentiment when I discuss A.D.—that my book is merely one document of many about the storm and its aftermath. And I make sure to mention some of the other great narratives about Katrina/New Orleans (a few of which are much more expansive in scope). Documentaries like Spike Lee’s When the Levees Broke or Tia Lessin and Carl Deal’s Trouble the Water. Books like Douglas Brinkley’s The Great Deluge, or Chris Rose’s 1 Dead in Attic, or Dave Eggers’ Zeitoun, or Dan Baum’s Nine Lives. Or more recent works like Roberta Brandes Gratz’s We’re Still Here Ya Bastards, and Please Forward, edited by Cynthia Joyce. And even fictional works like HBO’s solid series Treme. 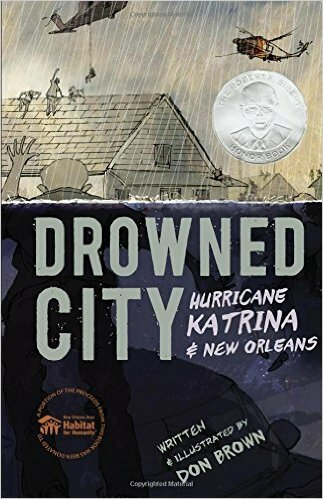 Definitely for a younger audience than A.D., Drowned City takes the reader through the breadth of the Katrina story, from the storm’s formation as “a swirl of unremarkable wind” in Africa to its building in the Gulf of Mexico and finally sweeping into Mississippi, Alabama, and Louisiana. The book shows New Orleans preparing for the storm and the city’s belated & haphazard attempts to evacuate. It shows the breaching of the levees, the people trapped in their attics, and the drowned bodies. The book details how helpless/useless the authorities in New Orleans were to deal with the flooding and the aftermath, and how thousands of people were abandoned at the so-called “shelters of last resort,” the Superdome and the Convention Center. Drowned City shows the chaos that settled over the city, how people were forced to help themselves to much-need supplies—and the instances of looting—and how some brave groups and individuals performed heroic rescues. The book spares no blows in its depiction of the ineptitude and infighting of officials like FEMA head Michael Brown, Louisiana governor Kathleen Blanco, and President George W. Bush. The book ends in October 2005 with the city finally dry, but totally devastated. It talks about New Orleans’ subsequent depopulation, particularly the decline of the city’s poorest (mostly African-American) populations. Nevertheless, the book ends on a tentative note of hopefulness. Drowned City is gorgeously illustrated, mostly in large panels of pen & ink and watercolor. And it is meticulously researched & documented, with a full source list/bibliography at the back. I often speak of A.D. as a “people’s history” of Hurricane Katrina. Don Brown‘s Drowned City takes more of a holistic perspective, and in that way is a perfect complement to A.D. I highly recommend you check it out.